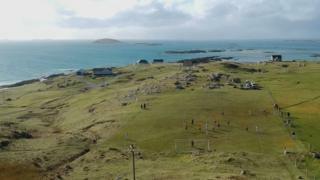 What makes a pitch in the Western Isles one of the best - and toughest - places to play football? The small island of Eriskay lies between South Uist and Barra in the southern isles of the Outer Hebrides' island chain on Scotland's Atlantic coast. Bonnie Prince Charlie first set foot on Scottish soil on the island in 1745 when he was mounting his bid to regain the Great British throne for his father. Eriskay is also famous for the grounding of the ship SS Politician, and its cargo of 250,000 bottles of whisky, on 5 February 1941. Author Compton MacKenzie used the shipwreck as the basis of his book Whisky Galore in 1947. An Ealing comedy of the same name followed in 1949. The small island, which has a population of about 140, has yet another claim to fame. Its native ponies are an ancient, rare and hardy breed. Eriskay ponies were used for transporting whisky salvaged from the SS Politician, and today have free rein of the island's beaches and its celebrated football pitch. Four years ago, football's international government body Fifa recognised the pitch as one of the world's unique places to play the game. But Eriskay FC's player-manager Sean MacKinnon says that does not mean it is any easy place for the so-called "beautiful game". "It's hard to play football in Eriskay because of the conditions are not always ideal," he says. "The pitch is different from most pitches people have played on," he adds. "It is not exactly flat. There is a wee hill in a corner and the top half has a wee bit of a hill and the bottom half is right on the edge of a really steep hill. "It's really exposed to the elements as well. "We could probably get Barcelona down to our level on that pitch." Former manager Martin MacAulay once described the pitch as having five corners instead of four because of its uneven surface. But he says: "You can't slag the pitch off because it is recognised by Fifa. "You can play football anywhere. If you can't play football on a wee bumpy pitch, you shouldn't be playing." Eriskay FC's preparations for each season is also a bit different from most football clubs'. "Animals have been on it all winter," says Sean, adding that one of the first jobs is removing sheep and pony dung from the field. He adds: "We line the pitch as well, and fill in the rabbit holes." Established in the 1950s, Eriskay FC plays in the six-club Uist and Barra League and enjoyed some league successes in the 1960s. Sean says: "We are the smallest team in the league, and we have the smallest pool of players to pick from. The majority of our players are from the island." But he adds: "Football means the world to the island. It's good for the community and the community comes to support us and helps the club financially."